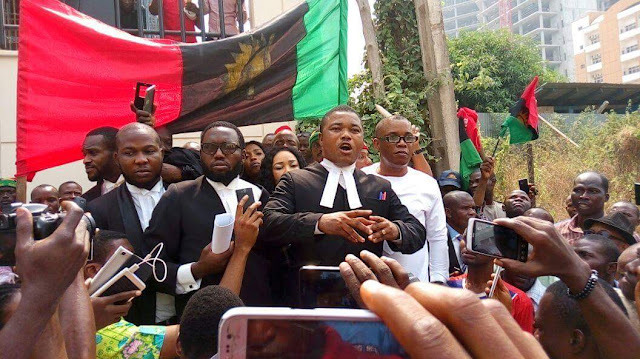 Barrister Ifeanyi Ejiofor, the defense counsel to the leader of the Indigenous People of Biafra, Mazi Nnamdi Kanu on Monday, following an application, prayed the court to vary its earlier ruling on the protection of the Federal government witnesses. Justice Binta Nyako had maintained that the ruling on bail application will not stop the trial which has to go simultaneously. She however, told the parties that she won’t reverse her earlier ruling on secret trial. She maintained that the aim of secret trial was to protect the identity of the security operatives who would be appearing before the court as witnesses. At the trial, Kanu’s counsel, Barrister Ejiofor, informed the court of a pending application which he had already served to the Prosecution counsel. He said that the application was pursuant to the Criminal Procedure Act anchored on the rights of the applicants to bail. But counsel to the Prosecution, Shuaibu Labaran, opposed the application, informing the court of a counter affidavit in that respect. Ejiofor told the court that his client is ready to clear himself of all the bogus charges preferred against him, adding that those charges were merely concocted to circumvent the order made by Justice Adeniyi Ademola on 17th December, 2015, directing the DSS to release Nnamdi Kanu unconditionally. However, in an interview with BIAFRA WRITERS shortly after the proceedings, barrister Ejiofor, said that the quashing of 6 out of the 11 count charges has changed the status quo which paved way for a fresh bail application for the defendants. He explained, “You know on the first day of March, 2017, a ruling was delivered on an application challenging the competence of the eleven count charges preferred against the 1st to the 4th defendant, wherein six counts out of the eleven count charges were struck out which fundamentally changed the status-quo because the defendants entered a new plea and in pursuant of which we informed the court that we are going to file fresh application for their bail and that was filed on 2nd of March, 2017, so it was just been heard and adjourned for ruling on 25th of April, 2017. “We also filed an application asking the court to review the order for protection of security operatives who will be coming to give evidence in court of which its order was made by his lordship last year and it was proportional to Section 732 of the ACJ Act and also Section 32 of the Terrorism Protection Act. “But that was when we had eleven count charges that borders on terrorism offence preferred against the 2nd defendant was subsisting. “So, on the basis of the fact that the count of terrorism preferred against the 2nd defendant was struck out on the 1st day of March, we had to file an application because the foundation upon which that order was made have been kind of overtaken by tsunami, so we filed an application to ensure that the order which the lordship has made is reviewed. Ejiofor insisted that the judge must listen to their argument before delivering a final ruling on the application when reminded that the judge gave an express order that she will not vary on her decision. He said, “ For the fact that she said it but the court has a duty to listen to the argument from both sides of the divide, and rule on it because if a ruling is delivered one way or the order, we will know what to do. But the most important thing is that the foundation upon which that order was made, the application was premised on Section 732 of the ACJ Act and Section 32 of the Terrorism Protection Act which borders on the offence of terrorism which has been quashed by the court.